Eat dinner as a family six or seven times a week, limit the time the child watches TV to less than two hours a day, and make sure he or she gets more than 10.5 hours of sleep a night. Those three simple household routines are associated with an almost 40% reduction in the risk of childhood obesity, according to Sarah Anderson, PhD, of Ohio State University College of Public Health in Columbus, and Robert Whitaker, MD, of Temple University in Philadelphia. The association remained significant even in the face of other predictors of childhood obesity, such as maternal obesity or being in a single-parent family, the authors said in the March issue of Pediatrics. "I imagine people are going to want to know which of the routines is most important: Is it limited TV, is it dinner, is it adequate sleep?" Anderson said in a statement, according to MedPage Today. 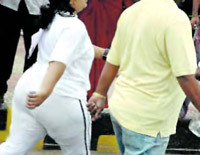 The All India Institute of Medical Sciences (AIIMS), New Delhi conducted a survey on children aged between 14 and 18 and reported that of the 2000 children studied, 17 percent were obese or overweight. Obesity in children is usually a result of the sedentary lifestyle, improper food habits and lack of physical activity. This may result in the child growing up to become an obese adult. Obesity is one of the leading causes of many disorders like diabetes, cardiovascular disease, high blood pressure and sleep disorders, Bolohealth reports. "Obesity is a major public health problem in pre-school aged children," Dr. Anderson says. "We know that obese children are more likely to become obese adults and we also know that obesity is associated with a higher likelihood of many adult diseases, particularly diabetes." Doctors have watched those numbers go up for years, but didn't have much advice for parents on how to stop it, and now they do. This new research comes as a pleasant surprise for families like the Zieglers of Westerville, Ohio, who sit down to dinner every night at home as a family. They knew their tradition was keeping their family connected, but they didn't know that it's also making their kids healthier, WTOL.com informs.